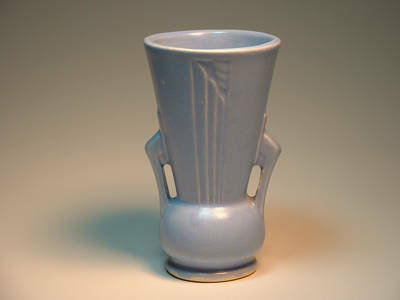 Description: Fake Roseville Moderne vase. Shape 810? This fake was possibly made from a mold made from a real vase. Now hopefully someone won't contact me a say its real. The bottom seems all wrong for Roseville, as does the clay type. Bassett shows this shape in a 10" vase. This one is about 7". 1. It helps educate buyers and sellers alike, in the hopes that no one gets one of these fakes in the future. 2. 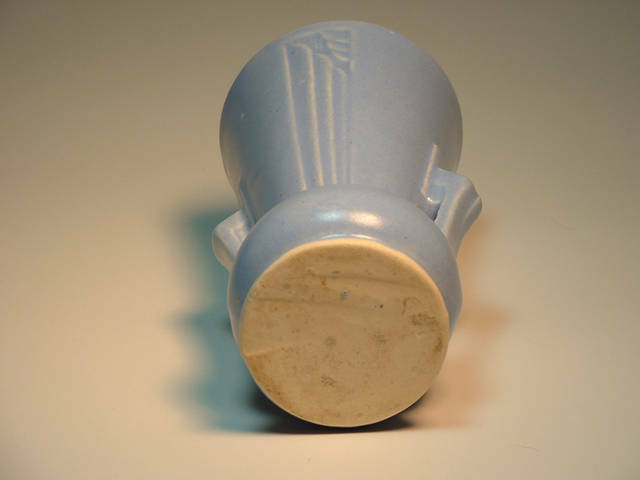 It helps point out that unlike ebay and other online auctions and online retail houses, Only Clay is monitored by its very knowlegable sellers and browsers, most of which are collectors. And unlike Ebay, comments can be posted without the seller filtering them. 3. We hope that these educational posts help build confidence in buyers and that they recognize that pieces sold on Only Clay have been filtered by collecters for condition and authenticity. Please note, if you would like to comment, you don't need to be a member in the discussion area, but please be constructive, so we can keep it this way.